1870s/1880s autograph album of Odietta M. Rich, "Odie", of West Bath, Maine. 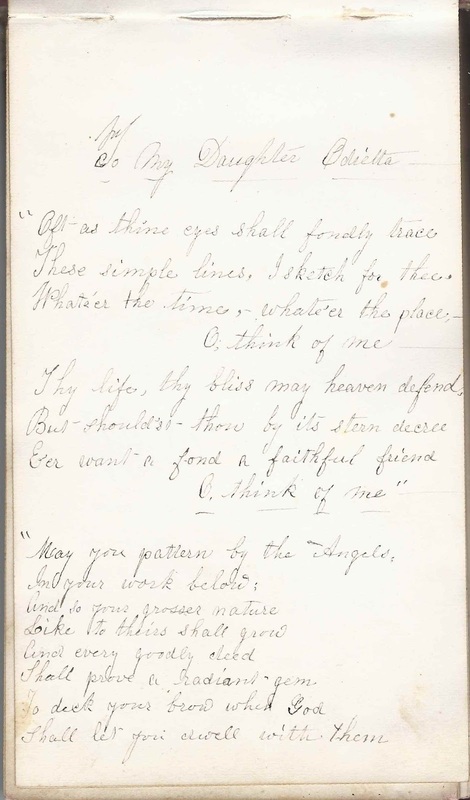 The album is approximately 8" x 5" and contains the sentiments of over seventy of Odie's relatives, friends and schoolmates. An alphabetical list of the signers appears at the end of this post. Odietta M. Rich was born about March 1863 at, I believe, West Bath, Maine, the daughter of Henry Raymond Rich and Ann Eliza (Mitchell) Rich. 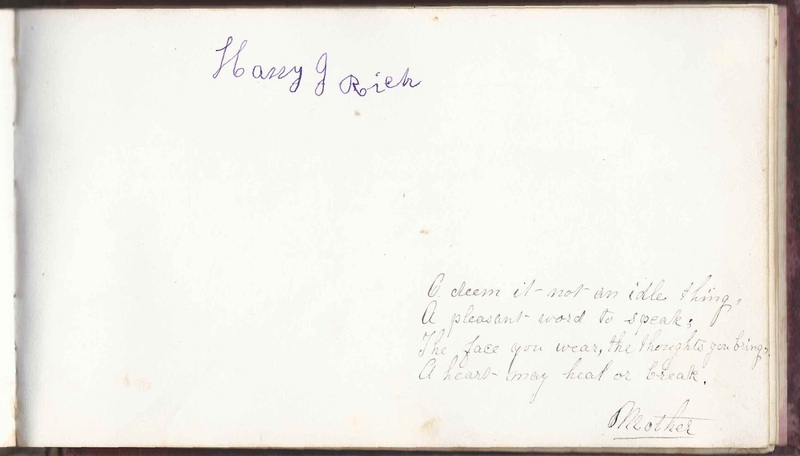 They each signed pages in Odie's album; her mother signed two pages, including this one that ran over onto the reverse. 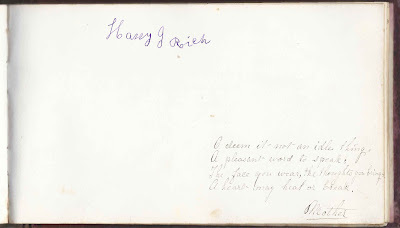 Later on in the album, Odie's parents signed facing pages; her brother Harry J. 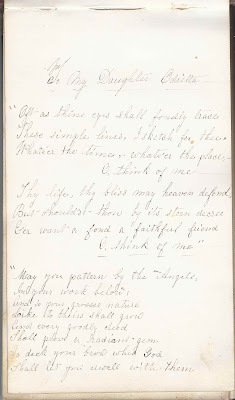 Rich, who was born about November 1871, signed his name in a childlike script on his mother's page. Odie had an older sister, Anna Augusta Rich, who had married George Harrison Butler by the time she signed a page in Odie's album. 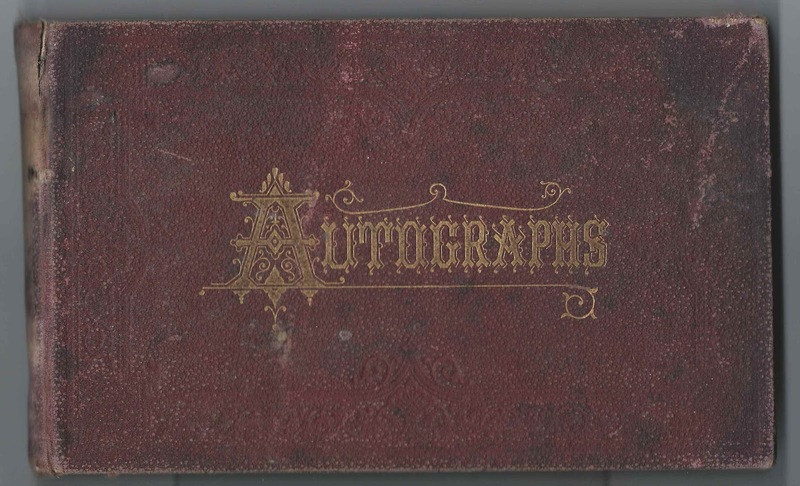 Several other people named Rich and Mitchell, including some who gave their relationship to Odie, signed pages in her album, as the list below shows. I don't believe that Odie ever married. 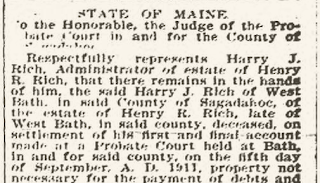 She lived at Phippsburg for a time and then, at least in 1920, lived with her brother Harry and their widowed mother at West Bath, on the dairy farm. 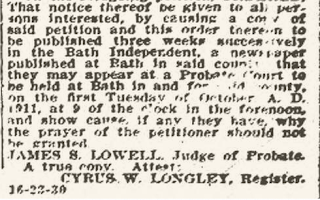 The three of them were still in West Bath at the time of the 1930 Census. 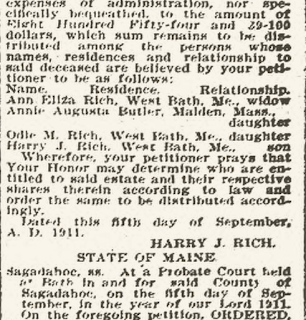 By 1940, Ann Eliza (Mitchell) Rich had died, but Odie and Harry were still living in West Bath, on the Berry Mill Rd. 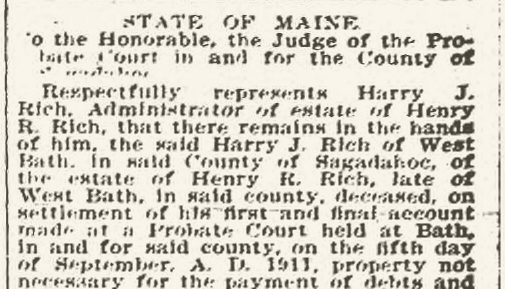 I found a newspaper record of the probating of Odie's father Henry Raymond Rich. 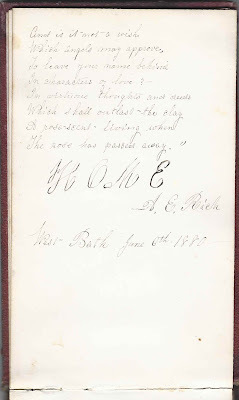 The digitized book "A Look into West Bath's Past", by William C. Purington, published in includes this recollection of Odie's mother, Ann Eliza (Mitchell) Rich. Sadly, the page containing the rest of her recollection is not shown. 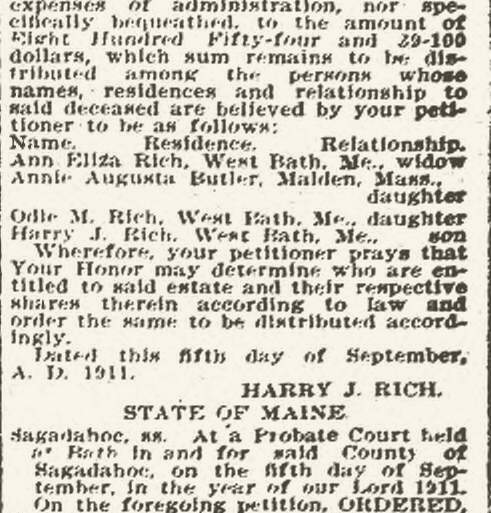 Another reference to Ann Eliza (Mitchell) Rich is contained in the August 12, 1925 edition of the Lewiston Daily Sun, under the headline "Descendant John and Priscilla Alden is 91". Scroll down the second column from the left to see the article. The last signer in the album, Lena Rich, who signed on March 23, 1878, included the initials B.H.S. I'm not sure whether the initials referred to Brunswick High School or Bath High School, and if Odie happened to have attended B.H.S. in the same class as Lena or at least the same school. Harry J. Rich died in 1961, but I haven't yet found a death date for Odietta. If you have corrections to the information above, or additional information to share on Odietta M. Rich and her family, or any of the signers listed below, please leave a comment or contact me directly. "Votre cousine, Ida". I'm not sure how Ida is related to Odie. 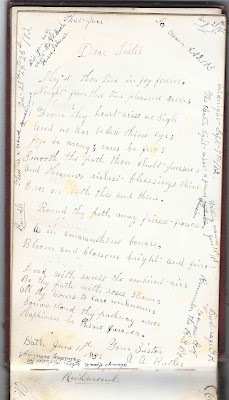 Sarah Brown, signed at West Bath, Maine, in 1877. 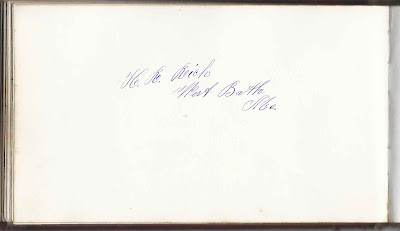 Middle initial might be W.
W. H. Brown of West Bath, Maine, signed on June 25, 1883. 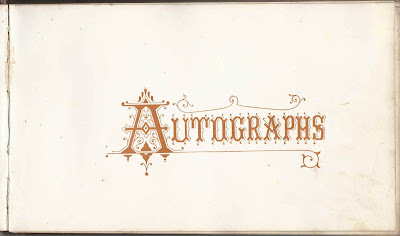 Abbie Butler, signed August 9, 1900. Abbie M. Butler was born 9 Sep 1888, daughter of Odie's older's sister Annie Augusta (Rich) Butler and her husband George H. Butler. 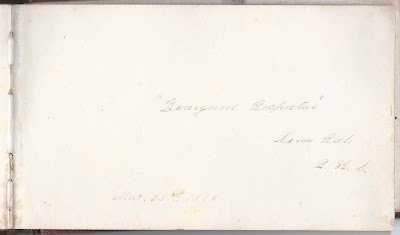 Rose F. Larrabee of Harding, Maine, signed on January 28, 1883. Harding is a village on the New Meadows River at Brunswick, Maine. 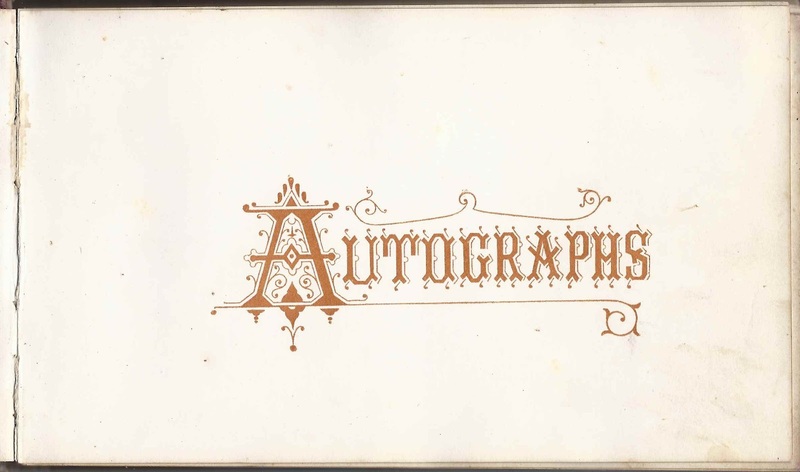 Nellie M. Larrabee of Harding, Maine, signed on January 27, 1883. Harding is a village on the New Meadows River at Brunswick, Maine. A. 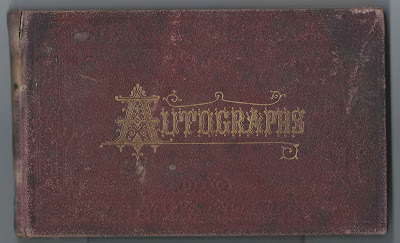 A. Mitchell, signed at West Bath, Maine, in 1884. Not sure of first initials. Odie's maternal grandmother was Abigail Alden (Clifford) Mitchell, but I didn't find a namesake daughter for her, and I didn't find a brother of Odie's mother married to an A. A. Uncle Jenks. This was Josiah Jenks Mitchell, older brother of Odie's mother Ann Eliza (Mitchell) Rich. Affie Euna Rich, signed on January 31, 1882; she was Affienna E. (Richardson) Rich, the wife of George W. Rich, who was the younger brother of Odie's father Henry Raymond Rich. Harry J. Rich. Harry wrote his name in childlike script on a page that his mother signed, facing a page that his father signed. 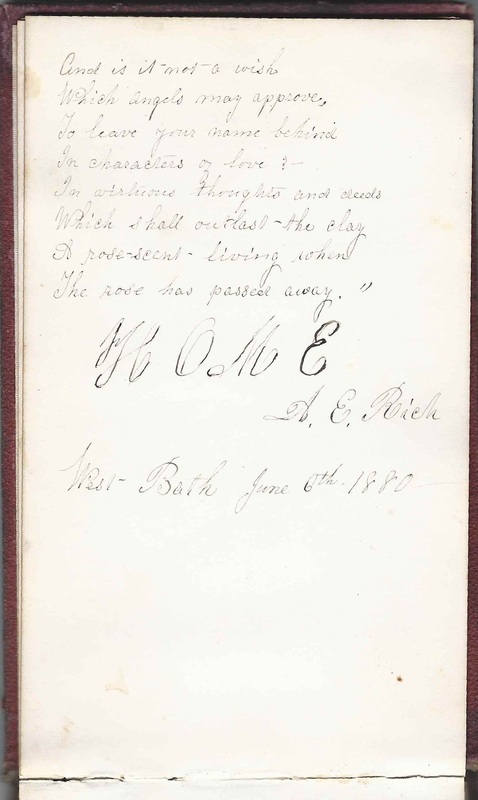 Mrs. Ann Eliza (Mitchell) Rich, Odietta's mother - she wrote on both sides of a leaf, at West Bath, Maine, on June 6, 1880. 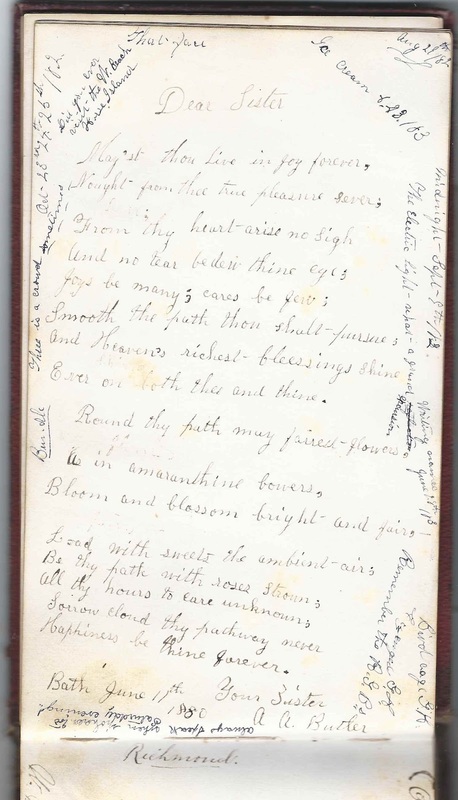 She signed a page near the middle of the book, facing a page signed by her husband. Her son Harry J. Rich wrote his name on her page. Lottie Winter, signed on August 11, 1877. Called herself Odie's cousin, I think she was Charlotte Winter, daughter of Alden Winter and Mary (Pettingill) Winter, related to Odie through the Alden line. Lottie wrote upside down.